Luxury is not always out of reach. And when we talk about buying a Luxury car, then it is more convenient to opt for pre-owned cars. Yes, Pre-owned vehicles are one of the most beneficial options to own a luxury car at a very competitive price. People tend to spend their hard-earned money on buying a brand new luxury car without understanding the cost-effectiveness and similar services in the pre-owned category. 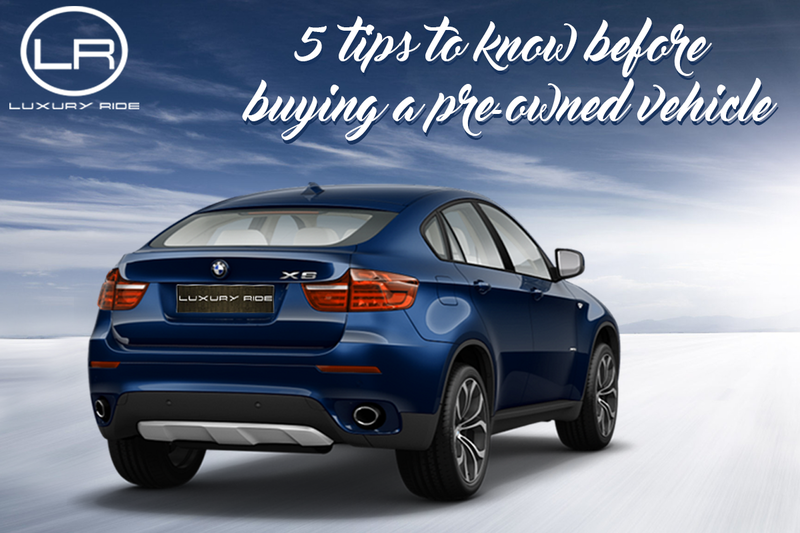 So let’s know some tips before buying a pre-owned luxury car. Simply going to buy a pre-owned vehicle will not be an intelligent move. Hence, it is important to research the model, car type and cost of the vehicle. Also, you can check online sites to know the availability before meeting the car dealer. Luxury Ride offers the best quality and high-end models in the pre-owned luxury car category. Their name defines the professionalism and competence in delivering the end product efficiently. After you complete the research, it’s time to meet the dealer and know more about the car. Don’t forget to check the car’s history and inspect well. Knowing a car’s history will evaluate the actual age of the car and the mileage numbers. Understand the usage and then opt for the selected model. Some pre-owned car dealers offer optimum services like extended warranty, after-sale maintenance services, free gifts on every purchase and many more. Luxury Ride, a one stop destination to all your pre-owned luxury car services offering exclusive benefits like buy back guarantee, good financing opportunities, premium insurance and 15 day cash back guarantee. Test driving the pre-owned vehicle will help you evaluate whether the model and car type will suit your preference. Also, while driving you can know about the current condition of the vehicle. If you opt for a CPO vehicle then the inspection and warranty will be provided at the time of purchase. It is a human tendency to negotiate before buying any product at a fair deal. Negotiations can be done only if you find the vehicle is more than the expected price. You can always ask the dealer or seller to quote the best price and the last one. Always remember to make the payment via cheque or bank transfers. This will help you keep an authentication of the purchase made. It is essential to buy the used car from an authorized pre-owned car dealer in order to get the best vehicle at a comparative rate. Understand the aftercare services and keep your luxury asset safe and secured. The above tips will help you get the best pre-owned luxury car. So don’t wait! Make your purchase with Luxury Ride, an authorized pre-owned car dealer and take the best buying decision today. Get ready to own your luxury vehicle at the best possible cost with premium features and aftercare services.